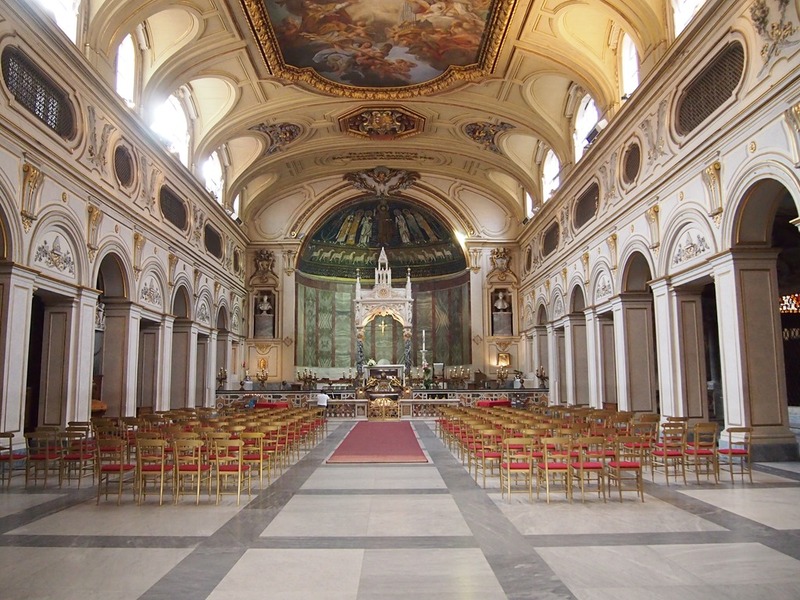 If there is one thing that Rome is known for – beyond Vespa’s, crowds and food – is churches. They dot the city, are free to enter and, if you go into one of the smaller ones, offer a pleasant respite from the heat and chaos of the city. I would usually throw a coin or two into the offering box, a good way to ensure some travel goodwill and to assuage any guilt when it came to ignoring the beggars on the church steps – the beggars, knowing how to prey on the guilt of the churchgoers, often clasped rosaries or pictures of the Virgin Mary beside their plastic cups. 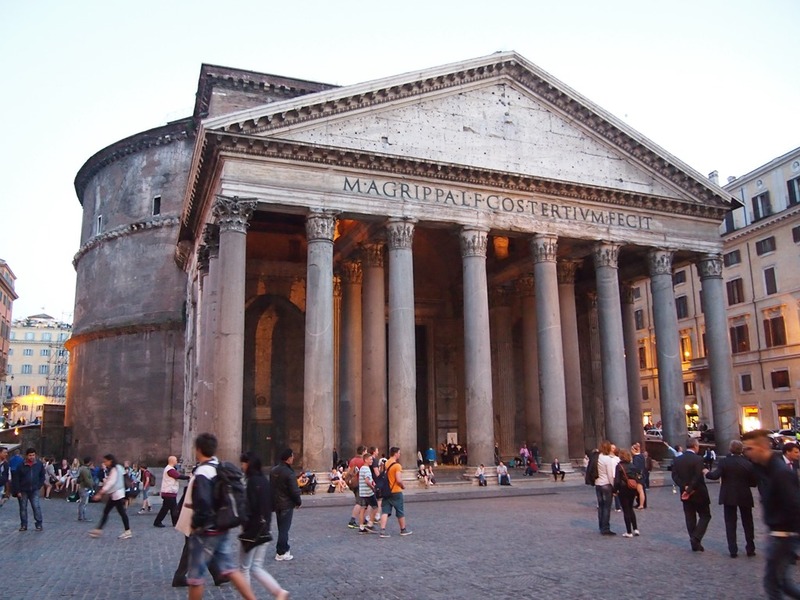 The Pantheon: The Pantheon is probably the most famous church in Rome, beyond St. Peter’s Basilica (which is technically in Vatican City, but that’s an argument for another day). It was commissioned during the reign of Augustus, in Ancient Rome, as a temple dedicated to all of the Gods, and rebuilt during the reign of the Emperor Hadrian in the second century. The crowds descend on the Pantheon en masse and while there is still technically a dress code, I noticed that it didn’t seem to be strictly enforced. I had read that it was one of the best preserved buildings of Ancient Rome due primarily to its continuous use. Once the ancient Roman gods fell out of favour and Christianity became the religion of choice, the temple was converted into a Catholic church. This happened around 600 AD, with the temple being dedicated to “Mary and the Martyrs” during its consecration in 609 AD – a church in honour of the Virgin Mary and the Christian martyrs who died in Ancient Rome for their beliefs. 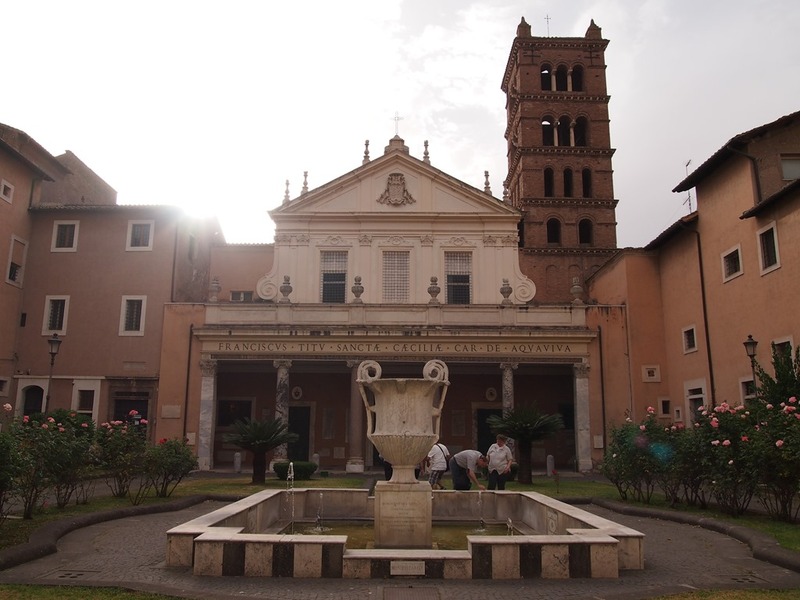 The statues and art depicting the Roman gods were stripped away and the decorations of the Catholic church were added. That being said – a lot of the church was stripped away, especially the marble from its exterior. The facade was slightly less impressive than I expected because of this, and there are holes where the iron (which held the marble onto the building) was also removed. There used to be a bronze ceiling on the portico which was stripped away to be used during the construction of St. Peter’s Basilica. The inside, however, is mostly original marble and, even though it has been extensively restored, the effect is really quite striking. Much of the architecture is early Roman and remains so to this day. 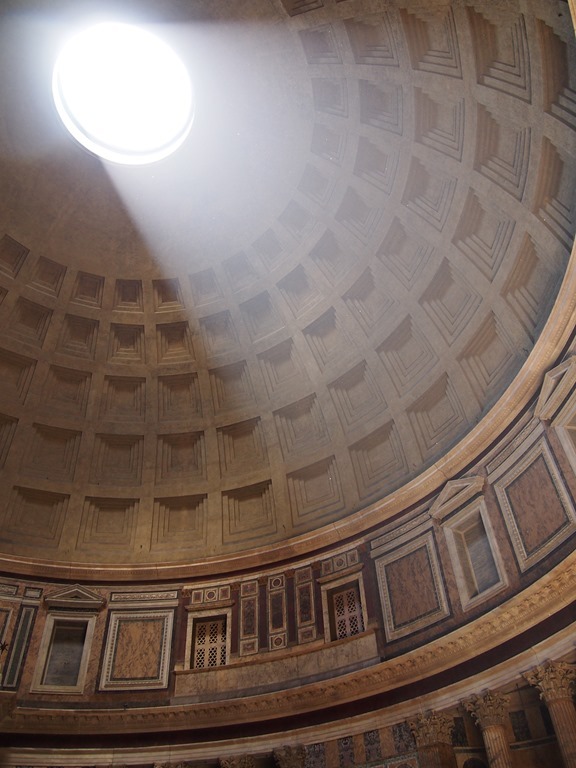 The building was studied by many of the great Renaissance artists and architects, many of which were inspired by the dome, an impressive sight not so much for its appearance but for the fact that the early Romans were able to create such a perfect structure. It apparently remains the world’s largest unreinforced concrete dome and, if someone was so inclined, it could perfectly fit a sphere of just over 43m inside of its shape. The walking tour guide seemed really excited by this fact. The very top of the dome is open to the elements – this was the initial design and it has remained open since it was initially constructed. The theory was that the sun would shine through, helping to create a column of light, directly to the gods above. In case of rain, however, there are drainage holes unobtrusively cut into the floor. There are several important and influential people buried in the Pantheon. Raphael, the famous Renaissance artist, was buried in the Pantheon as per his wishes and as an acknowledgement of his work and influence during his life. There are also the tombs of two kings – Vittorio Emanuele II, the first king of the united Italy and Umberto I. It should also be noted that Queen Margherita, after whom the famous pizza was named, is also buried in the Pantheon. Italy has officially been a republic since the end of World War II, however the tombs are apparently watched over by supporters of the royal family. Occasionally there is a guestbook, where supporters of the expelled royal family can sign to indicate their support. Church of Sant’Ignazio: During the walking tour we stopped into the church of Sant’Ignazio, famous for its intricately painted ceiling and the tricks of its artistry. When you look at the ceiling of the nave, depending on where you stand, you either see a perfectly proportionate painting that appears to stretch high into the sky, with straight columns… or you see a skewed painting, with strange angles. incredibly ornate interior, even without looking up! 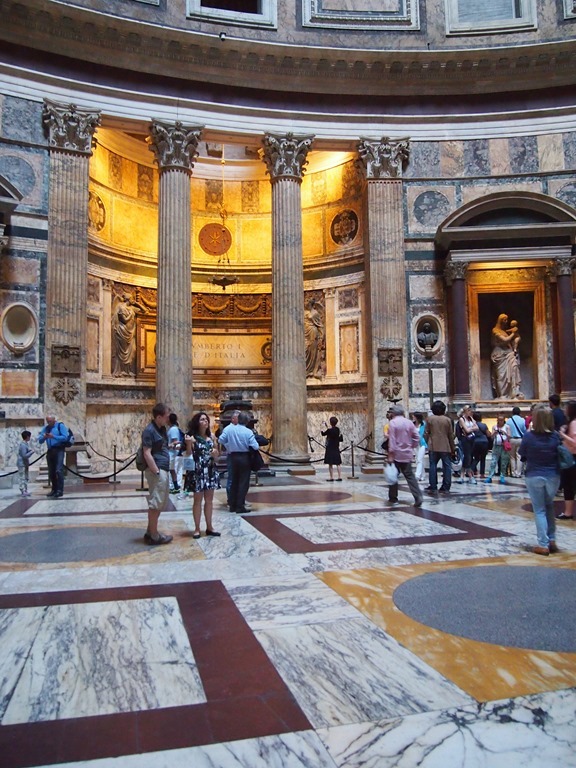 There are two focal points, marked with yellow marble on the floor, and if you stand on the one closest to the door you see exactly what you’re supposed to. This was the first time that church decorations were designed for the poor people – for the working class – as normally the front of the church, near the altar, was the most ornate. Coincidentally (or not), the front is exactly where the richer members of the community sat. The second focal point is set so that you can see the dome of the church. Or, more accurately, the painting that is designed to look like a dome. 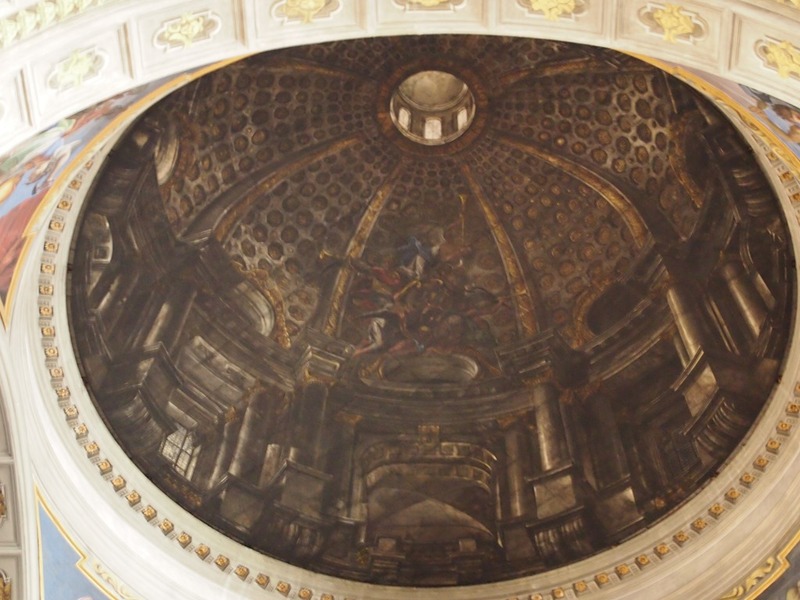 There was supposed to be a dome built in the church, but it never happened and the painting was added in the late 1600s to make up for it. When you’re standing on the focal point, as you should, it’s hard to believe that you’re staring at an optical illusion. Church of Santa Cecilia in Travestere: I visited this church during a Rick Steves audio guide walking tour of the Travestere area. It is a church that dates back to the 5th century and it honours St. Cecilia, an early Christian martyr. The tradition, and the story, is that the church was built over the remains of her home. Early Christians held their religious celebrations and gatherings in private homes as there were no churches at the time and Christianity was still classified as a cult. It was also still very much illegal as the Roman Empire had decreed that citizens should celebrate and worship the Roman gods. St. Cecilia apparently held religious gatherings in her home and her risk taking is what led to her eventual death. The Romans sentenced her to die by beheading. There is a statue of St. Cecilia in the church, located in front of the altar, and the story behind the statue is actually rather interesting. 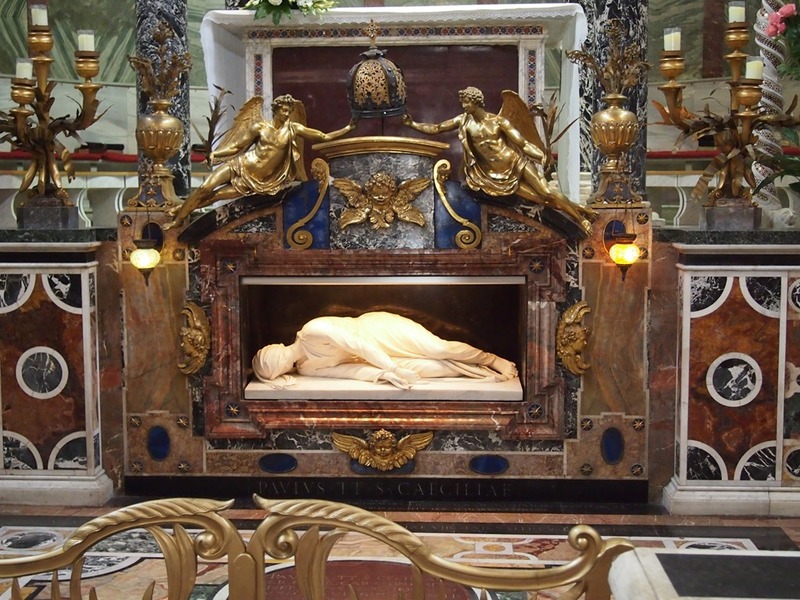 The statue was created in 1600 and the artist was apparently there when the tomb of St. Cecilia was opened the year before – there is a sworn statement attesting to this located in front of the statue. The artist then created the image exactly as he remembered seeing it, as Cecilia’s body was rumoured to be perfectly preserved, her body still containing congealed blood. This fits into the belief of the incorruptibility of the body, a supposed attribute of the saints. 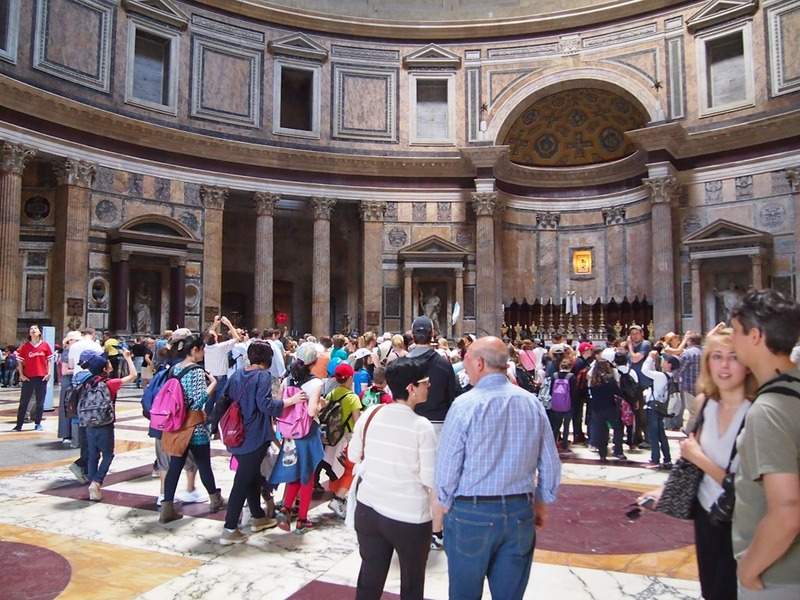 I am not a churchgoer and although I enjoyed visiting many of Rome’s churches – often just to get out of the heat a bit – I couldn’t help but marvel at all of the money that was spent in their creation. Not to mention all of the money to required in upkeep over the centuries. I knew the Catholic church was rich – and I didn’t have to visit the Vatican to know that – but the ornate decorations, the tons of marble, the years of toil spent by artists… it all just seemed so extreme to me. Rome really underlined the excesses of worship during the Renaissance – and even before, with the expensive and fancy marble of the Pantheon – a tradition of richness that continues today, not just in Catholic churches but in religion as a whole. It was food for thought, at least. You should have stayed for Communion! !